When it takes up to four million pounds of sand to frack a single well, it’s no wonder that demand is outpacing supply and frack sand producers are becoming the biggest behind-the-scenes beneficiaries of the American oil and gas boom. 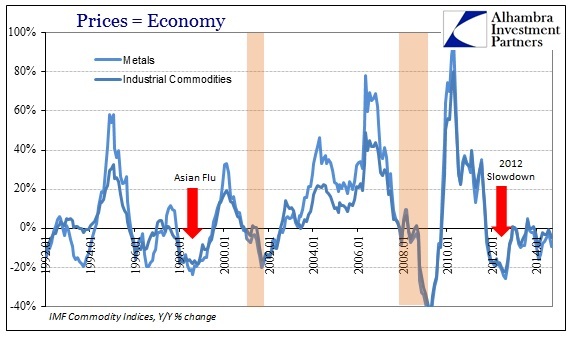 Demand is exploding for “frac sand”–a durable, high-purity quartz sand used to help produce petroleum fluids and prop up man-made fractures in shale rock formations through which oil and gas flows—turning this segment into the top driver of value in the shale revolution. Frack sand exponentially increases the return on investment for a well, and oil and gas companies are expected to use some 95 billion pounds of frack sand this year, up nearly 30% from 2013 and up 50% from forecasts made just last year. Pushing demand up is the trend for wider, shorter fracs, which require twice as much sand. The practice of downspacing—or decreasing the space between wells—means a dramatic increase in the amount of frac sand used. The industry has gone from drilling four wells per square mile to up to 16 using shorter, wider fracs. In the process, they have found that the more tightly spaced wells do not reduce production from surrounding wells. This all puts frac sand in the drivers’ seat of the next phase of the American oil boom, and it’s a commodity that has already seen its price increase up to 20% over the past year alone. 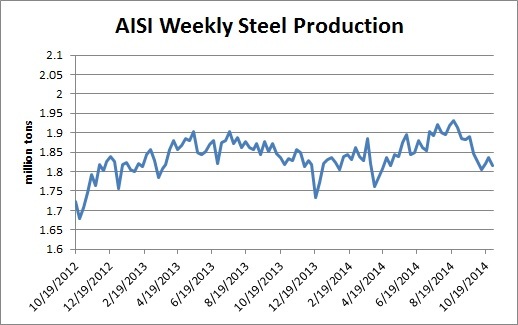 Steel production is bouncing of the low point but not recovered. 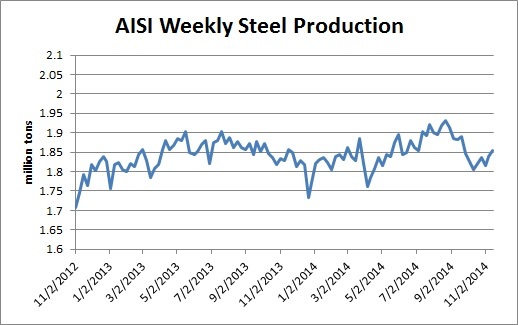 Steel production remains lower and fell again last week. I'm the executive vice president for a steel casting trade association, the Steel Founders' Society of America. I've got a crazy wife, five crazy children, three crazy people that married into the family, and two crazy fun little grandsons.